Welcome to Victory Ford! We’re a new and used car dealership for the Ontario area, offering both new and used vehicle sales in Chatham and a comprehensive car ownership experience for our customers. We welcome our customers’ questions and feedback, so should you have anything you’d like to say to us, please contact us at any time! There’s a lot of Ford history throughout the Ontario area, and we’re proud to have been a part of that. We’ve been a part of your community for some time now, actively involved in local sports leagues, charities, and fundraising. 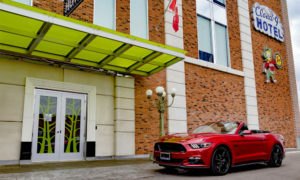 Today, the Victory Ford dealership has a brand-new, state-of-the-art facility, and on it’s walls you’ll see our awards from Ford of Canada: the prestigious President’s and Diamond Club awards for customer satisfaction. We are committed to earning lifetime trust and loyalty based on our core values of integrity, friendliness, and pride in workmanship. By focusing on these values, we will build our Sales and Service business into a successful, Community-Minded Company with Loyal Customers and Employees. In 2010 Victory Ford Lincoln officially joined the Lally Auto Group after Vince Lally acquired the dealership from previous ownership. The Lally Family owns multiple franchises in the Chatham-Kent and Essex County areas and has maintained a commitment to customers that is second to none. This commitment started in 1946 when Ray and Rita Lally opened a small BA service station in Comber, Ontario. During that tie, the Lallys built a reputation for customer satisfaction that extended far beyond the confines of the small rural town. In the fall of 1982, the family became a Ford franchise owner. Ray and Rita’s son Vince, who grew up learning the service business from his parents and had become a licensed mechanic, later purchased the dealership from his parents. Many things have changed but taking care of the customer has been the cornerstone of every success and will continue to be the foundation at Victory Ford.